This thick-fringed French keyboard players and martial artist is from the King of Fighters games, a major series of brawling video games. Granted she’s not a super interesting or very fleshed out character, and only has one canon appearance. However, she is popular with fans and could be used as a generic street level character of opposition. Given that she has two wildly different forms and powers she distinctly has that sort of video game feel that when you defeat her she takes on another more powerful form. Marital Status: Single and loving it ! Known Relatives: None, although she is assumed to have some very distant relation to all other Orochi bloodline members such as Yashiro, Chris, Goenitz, and Orochi. Group Affiliation: New Face Team, Four Heavenly Orochi Kings. Eyes: Unrevealed (they’re never actually shown, forever hidden in the bangs of her hair !) Hair: Brown. Shermie primarily uses her superior agility to perform acrobatic grappling techniques. She’s patterned off female wrestlers from Japan, with similar flashy moves and skimpy outfits. She seems to have a bit of control over gravity. Shermie is able to throw huge opponents much further than her strength and mass should allow. She’s also capable of jumping a lot higher than a normal human. That said she isn’t terribly powerful especially by KoF standards. Her whole strategy is to seduce men with her beauty and then try to throw them. And there’s a fair few tournament fighters with whom that’s not going to work. Otheriwse, she’s a decent musician and dancer. Create electricity from thin air. Fire projectiles of electric energy. Infuse her attacks with electricity. Summon thunder from the sky. 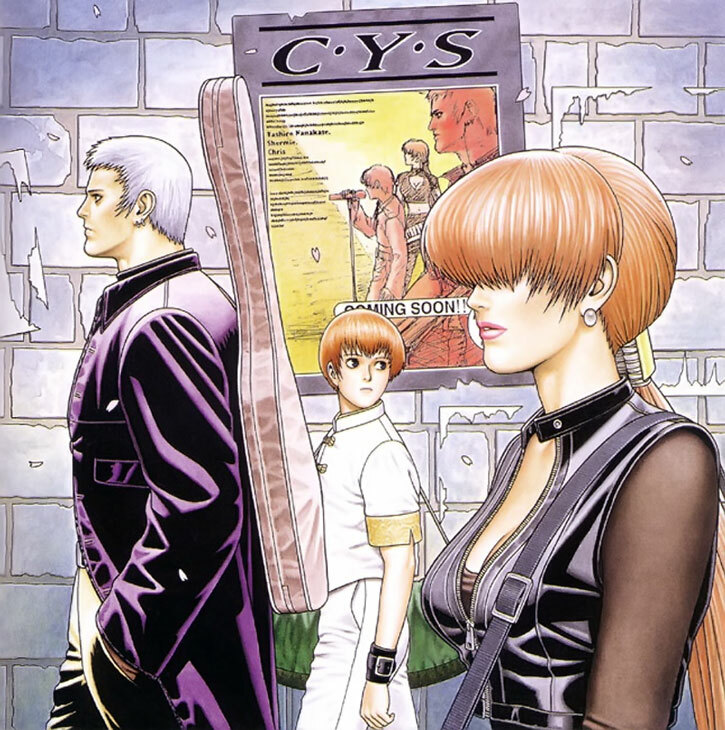 Shermie, Yashiro Nanakase, and Chris formed a band known as CYS. They had some success with their musical endeavors. One faithful day they entered a battle of the bands. They were doing quite well until the final round where they found themselves competing with none other than famed KoF legend Iori Yagami. While talented they were sorely trounced by Iori’s singing skills. Shermie and Chris were willing to accept defeat, but Yashiro became enraged and swore vengeance. 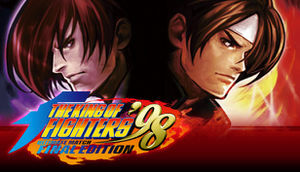 Yashiro found out that Iori was competing in the upcoming KoF ’97 Tournament. He vowed that if they couldn’t defeat him in a battle of the bands then they would defeat him in the ring. Shermie and Chris, being followers without anything better to do, decided to tag along for the ride. They participated as the New Face Team. Since they weren’t accomplished fighters, they had not received an invitation to the prestigious tournament. Thus, they got in by stealing the American Sports Team’s invitation (a running gag in KoF). Shermie is said to have taken down the team’s leader, famed basketball player Lucky Glauber, by seducing and then throwing him. As expected the inexperienced team washed out in the first round. They did decide to stick around and watch the rest of the tournament. It was almost as if an unseen hand had guided them here. Towards the climax of the tournament Shermie and the other members of the New Face team started to experience the Riot of the Blood. This was a result of their cursed Orichi heritage. The Orochi are nihilistic demons, bent on eradicating the human race. When the seal holding their demonic ancestors back was broken, the New Face Team and the tournament boss Goenitz started vomiting blood. Turning into Orochi Heavenly Kings, they went on a rampage. There’s an implication that she was defeated in single combat by Benimaru Nikaido. They are both masters of lightning (at least she is in her Orochi form) and Shermie’s Oroachi form was considered his dark counterpart. It is implied that Yashiro killed his defeated bandmates after he was himself bested. 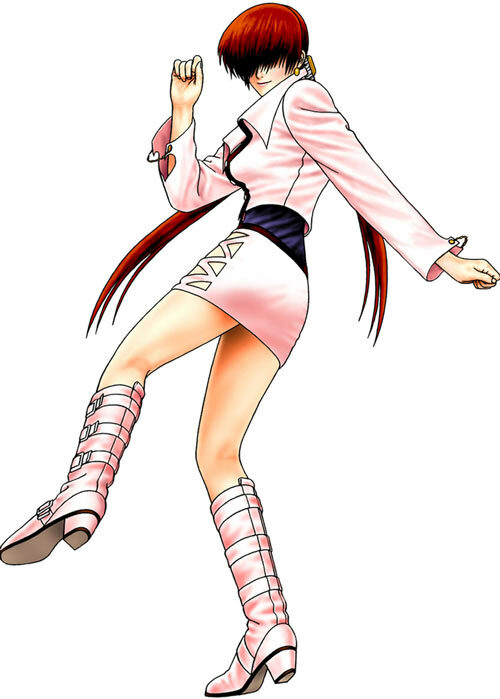 This was her one and only canon appearance, so Shermie is believed to be deceased. Shermie made two noncanon appearances and they are both pretty hokey. In SNK Gal Fighters the New Face team has forsaken their Orochi heritage and are living peacefully. The tournament is women only, and the prize is one wish granted. In her ending she wishes for a giant hamster and a giant cage to keep it in and she then proceeds to ride it around like a horse (!). Shermie is a tall, statuesque, well proportioned, voluptuous woman. She has an odd hair style where her bangs completely cover her eyes as well as two pig tails. That’s clearly a product of the 1990s. Her outfit is a tight pink miniskirt and matching jacket that leaves the midriff bare with a tight purple shirt underneath. The skirt has a weave pattern that exposes plenty of thigh and the shirt is low cut showing off ample cleavage. Shermie is a Japanese stereotype of a beautiful and shapely European woman. She is friendly and outgoing and will flirt with men she finds attractive and spends plenty of time dreaming of romance. She also has a pet hamster that she adores (and likely a bunch of other “girly” hobbies). Shermie doesn’t seem to take fighting seriously. She is often dancing around during matches, or checking her cell phone. Obviously she’s a superficial air head and a follower. She leaves all the thinking to Yashiro and just kind of tagging along for the ride. When she enters the Riot of the Blood she becomes a bloodthirsty killing machine that will do anything, up to and including sacrifice her own life to free the Orochi and wipe out humanity. The New Face Team could be inserted as is. Given the mystical nature of they’re threat they’re likely to run afoul in the mystical community. Having them confronted by the trenchcoat brigade could be interesting. Adrenaline Surge only works with Gravity Decrease, Str, and Martial Artist. Gravity Decrease has range of touch only and can only be used for her throw techniques. Based on her strength level she still manages to throw impossibly heavy opponents quite well and quite far. Attractive, Connoisseur, Expertise (Hamster breeding, French films), Language (French), Lightning Reflexes. Yashiro Nanakase (High), Chris (High). MIA toward Handsome men, Oblivious, MPI (Orochi taint and general absent mindedness). Adrenaline Surge works with all powers. Electric Being is can only be used when she’s flying through the air. Yashiro Nanakase (High), Chris (High), Orochi (High). CPI (Genocidal maniac), Catastrophic Rage. In her noncanon appearance in 2002 Shermie got a slight upgrade. Increase Adrenaline Surge to 06 and Lightning to 07. 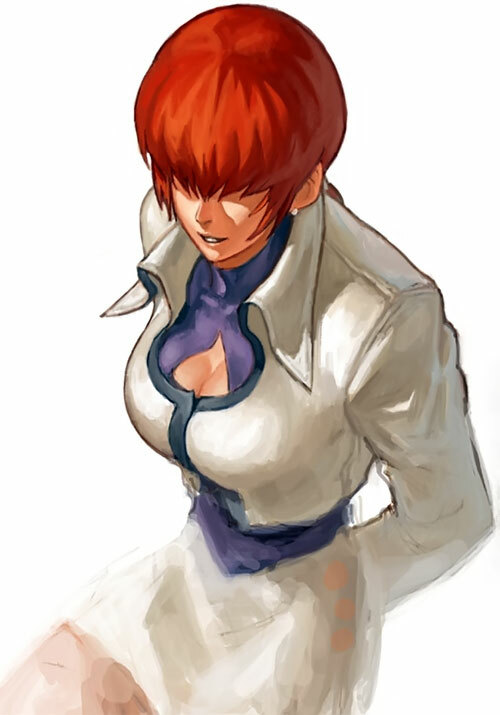 In the upgrade of King of Fighters 2002: Unlimited match up her Lightning one more point. 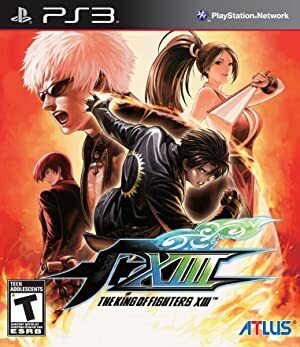 Source of Character: King of Fighters video games.